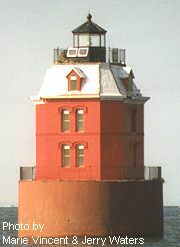 Sandy Point Shoal Lighthouse – Chesapeake Chapter U.S.L.H.S. Directions: The Park (open 6:00 a.m. to sunset) is at the western terminus of the Bay Bridge; follow the signs to Sandy Point State Park – exit 32. The guard can direct you to the lighthouse.